As US lawmakers consider the relative merits of a package of proposed changes to the American tax code, a global network of expat Americans is calling on their fellow countrymen in Expatland to urgently sign a petition calling for the US to end its citizenship-based taxation regime. 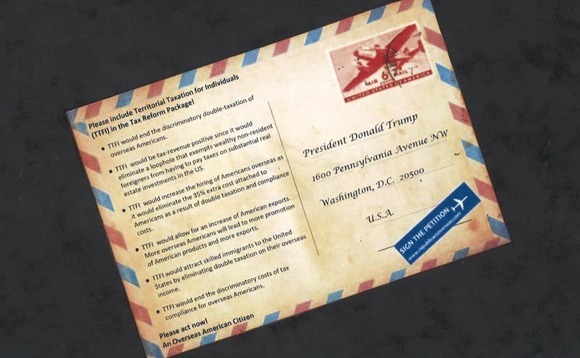 The petition calls for “territorial taxation for individuals”, or TTFI, to replace the current American system of taxing Americans for their entire lives, unless they renounce their citizenship, on the basis of their being American citizens. The US is all-but-unique in its use of citizenship-based taxation (Eritrea is said to be the only other country that taxes in this way). And as the US has ramped up its efforts over the last few years to come after its estimated 9 million expatriates for what it says are unpaid taxes and fines, growing numbers of these expats are struggling to comply, and many have sought to renounce their citizenships as a result. That many American expats are paying tax in the overseas jurisdictions in which they live is a source of frustration, though double-tax treaties can be effective in reducing their burden, though only partially. Although both the Democrats Abroad and the Republicans Overseas officially endorse the change, the petition in question is being promoted by the Republican organisation, though spokesmen for the campaign say this reflects the reality that the politicians in Washington who matter most in this debate are the Republican lawmakers, because they outnumber the Democrats. Also, they note, the Republican National Committee officially supports the move to TTFI, whereas the Democratic National Committee does not. Solomon Yue, vice chairman and chief executive of Republicans Overseas as well as a member of the Republican National Committee (RNC) from the state of Oregon, stressed the significance of the RNC’s endorsement, which formally came in August in response to a resolution put to its members. Still, he noted, the TTFI resolution is not, for now, included in the tax reform package before the House of Representatives. Although Yue says Congress “needs to hear from 9 million overseas Americans” on the matter of the TTFI proposal, Redmond says the organisers of the petition campaign will be happy if they can nail 6,400 signatures by 22 October, when the petition is due to be presented to Congress – or around 4,500 more than they have now. This is because a Republican National Committee petition on a different aspect of tax reform that was sent to the party’s 60 million-member strong database received around 6,400 responses. “We want to show them how strongly just 9 million Americans overseas feel about this issue,” he explained. As reported here last month, the campaign to ditch the citizenship-based tax model has also been endorsed by such organisations as the American Citizens Abroad, Americans for Tax Reform, the Heritage Foundation and a number of American chambers of commerce and other expat groups. Under citizenship-based taxation, American citizens living abroad are obliged to file tax returns to the IRS every year, as well as certain other documents, such as Foreign Bank Account Reports. Although many don’t have to pay tax to the US if they’ve already paid that tax to the government of the jurisdiction in which they live, certain taxes that they aren’t billed for locally they may be expected to pay to the US. And even if they owe nothing, the complexity of the forms is not just daunting to the expats themselves, but often to the tax experts they consult for help, sources say. One estimate is that because of the citizenship-based tax regime coupled with the Foreign Account Tax Compliance Act – brought into force in the wake of the recent global financial crisis, to target the offshore bank accounts of American citizens in order to boost tax revenues – expat Americans pay an average of US$2,000 to have their tax returns done, compared with a US average of just US$200. According to proponents of the change in the tax regime, a move to territorial taxation would be “tax-revenue positive” for individuals, as it would eliminate existing loopholes that allow wealthy foreigners living in the US to generate substantial income without paying taxes that they would otherwise. To see (and possibly sign) the petition calling for the US to change to a territorial tax regime for individuals, click here. To read a summary of the Democrats Abroad’s position on the matter of tax reform, and why it also supports residency-based taxation, click here.